Millennials – born between 1980 and 2000 – are truly more tech savvy than any other generation ever; and it is because of their affinity for technology that the retail space has evolved to be what it is today. Millennials are more than happy to have access to product reviews and price comparisons at their fingertips. Therefore, it isn’t surprisingly at all to know that 84% of them respond to push notifications sent to them by retailers and brands – with males being more responsive to females (86% vs 79%). Millennials seem to love a good old, perfectly-timed push message on their devices! Given how important a smartphone is in a millennial’s life or how necessary browsing through online stores on the desktop is for him or her, push notifications – if executed well – are not “pushy” at all for a typical millennial. Yes – and this love isn’t restricted to just online stores, millennials are equally responsive to brick-and-mortars. So if your business is running a flash sale or has coupon codes to offer – make sure you use the push medium to reach out to the millennials. You are sure to get a positive response from them! Of course! Why not? As mentioned before, millennials keep themselves updated with the latest brands, trends, sales, etc. etc. Marketers can reach out to them through push notifications to announce the new product launch. The response will be phenomenal! Location-based push notifications are always tricky. Such messaging can appear to be creepy if it’s not well-thought and executed. But if a millennial is around a physical store of a brand he or she visits online, then a push message is enough to nudge the millennial to check out the brick-and-mortar shop as well. Using emoji’s in marketing copies is the latest trend and they seem to be working just fine for millennials and retailers alike. Brands such as Nykaa, Domino’s Pizza, Good Barber, PINK Nation, etc. are doing everything in their power to harness the magic of emoji’s in push for better engagement. Since emoji’s are so popular and they seem to strike a personal chord with the target market, it is vital for marketers to leverage the use of emoji’s as they do make the messages look more personal, and the brand more approachable to the millennials. However, at the same time, brands must be careful while using emoji’s and use them in moderation in the copies. All retailers and brands must have some clarity in regards to who is a loyal customer and who isn’t. So if you try to interact with a millennial customer via push, chances are he or she would response positively. For millennials, the overall buying process is very important. In fact, 95% of millennials want to be courted by their favourite brands. Obviously – if you offer coupon codes, run flash sales, give an excellent shopping experience and a solid after-sales service, your customer is going to be pleased with you. Contrary to popular belief, millennials make loyal customers. Besides the product and its cost, a millennial likes to be treated as a valuable customer, which is why many millennials seek discount deals and personalized promotions. For millennials, loyalty is a big deal and marketers can definitely tap the potential of loyalty programs to get them to shop from them more often. 39% of millennials will get annoyed if your messaging doesn’t add a value to them. Put your heart and soul in the copy, and you will be surprised to find a boosted millennial engagement. 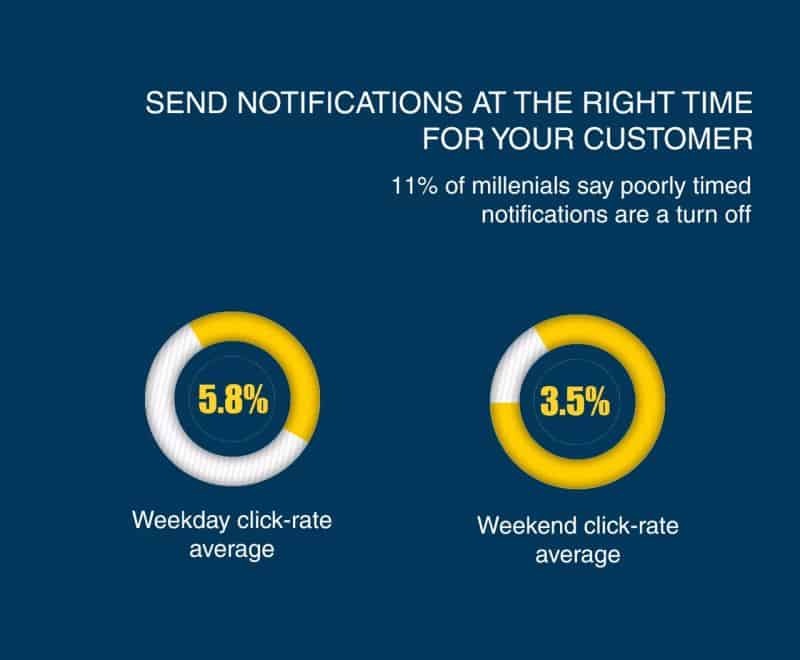 11% of millennials get really annoyed if a push message is sent to them while they are at work. Why infuriate a happy customer? In short – don’t get pushy with millennials unless you are sure the messaging is relevant and personalized and suits their preferences. Millennials or not, Wigzo can help you to send personalized & trigger based notifications and boost customer retention by 26%. We are not kidding – try the tool for yourself.